Vintage Clark's Filosheen embroidery threads. I am very pleased with this score of awesome vintage embroidery threads that I made on eBay recently. 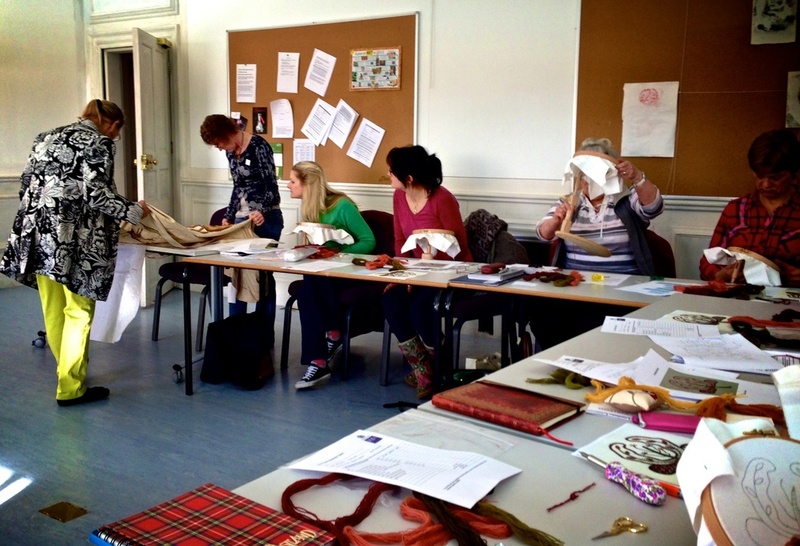 I've been wanting to do a class at the Royal School Of Needlework for quite some time now. 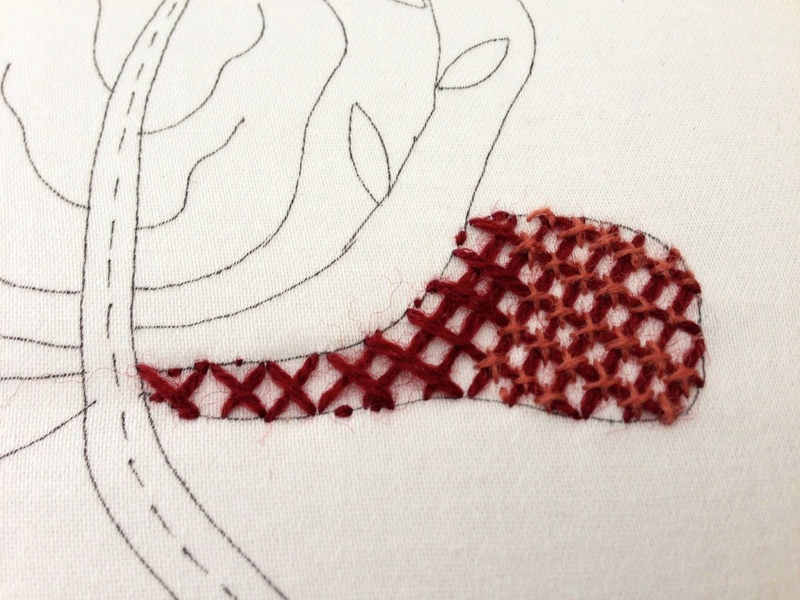 I originally got back into embroidery via a Saturday class at The Idler Academy. It was a lovely afternoon which inspired me to pick up my hoop and try something that would take me out of my music-obsessed work treadmill and give me something to do with my hands that wasn't cooking. Various things, like work, life, and the fact that the RSN classes fill up really quickly, meant it never happened - until now! 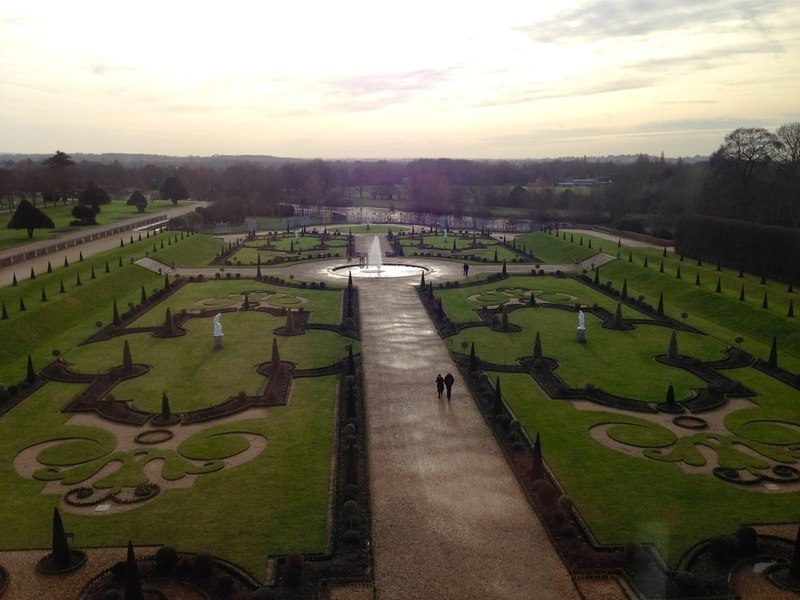 The RSN is based at Hampton Court Palace which is just outside London on the Thames. Best known as the residence of Henry VIII, it's a gorgeous old pile - a mix of Baroque and Tudor architecture, and the very embodiment of Britain's long-standing rivalry with the French (Hampton Court and Versailles tried to out-bling each other for a few hundred years). Just being on the grounds makes you feel as if you are doing something of great importance. I feel the legacy of centuries of embroideresses looking over my shoulder as I walk down the grand drive in the early morning light. The sun rises behind the palace grounds, so the buildings rise from the earth like a dark mountain as the winter sun blinds you on approach. Surely this is not an accident but is designed to intimidate visitors. We assembled in the "lunch barracks" - a bit like a prison dining room, where I waited along with 20 or so other silent ladies. Are we all thinking of Anne Boleyn? Ha. Eventually we are led up, through Christopher Wren's Fountain Court, up many flights of well-worn stone stairs, to the apartments which the RSN occupy on the top floor. As we marched down the long corridor to the classrooms, I can't help but feel a bit like I'm in a film - it's all so quintessentially British and wonderful. And I haven't even gotten to the stitching yet. 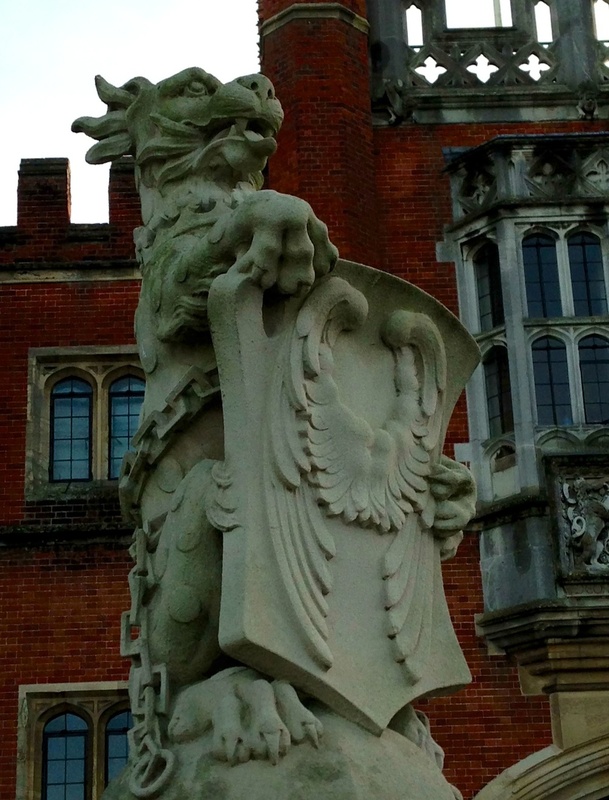 There are twelve students in the Introduction to Jacobean class - all female, aged between early 20s to perhaps 70. The room is large, bright white and flooded with light from the windows which overlook the picturesque palace gardens and the river. With such a view you really don't want to be staring at a hoop, but that's what we're here for! We are greeted by our tutor Helen L Stevens and everyone is given a kit which comprises the design we are going to be stitching printed onto some cloth, wool, needles, a stitch diagram and some instructions. There is also a second tutor working with Helen, a woman who is introduced as Louise. (I got the impression she was one of the people running the school, she's not listed as one of the school tutors on their website anyway.) When Helen asks, it seems like all of us have some previous experience of stitching, so she is able to jump in a bit more quickly than if we were absolute beginners. We fasten our designs in hoops mounted to the table and off we go! The first useful bit of information I get is when Louise shows me how to thread the needle without a threader. It's a bit difficult as we are using needles with a small eye and getting two strands of fuzzy crewel wool through them can be a struggle! You need to fold the wool over the needle, pinching it very tightly to make a crease in the wool, then still pinching, pull the needle out and push the crease through the eye of the needle. One of those things that you really need to see to understand I think! Helen tells us Jacobean work should be done from "back to front", that is you should stitch the elements of the design which should appear to be on top (perspective wise) last. So we jump straight in with a trellis filling, something I have never done before, which is great. Mine turns out decidedly wonky, which becomes really apparent when I start doing the decorative crosses which couch down the trellis. But what the heck, I'm here to learn! We have a little break for tea, coffee and biscuits around 11, and then back to work doing a buttonhole square "checkerboard" filling. I'm doing great until I have to reverse the stitch to head in the opposite direction, and my brain totally freezes and just won't process the information to my hands. Louise helps me sort it out, but the rusty wheels in my head are grinding really slowly and noisily. Sometimes I find that's the way it is with embroidery - certain stitches come really naturally, and others just take time to embed themselves in my gray matter. It's like anything mechanical I think - dance steps, manual gear shifts.... we need to train our muscles to move in the right order. My friend Pandora, who is at the class with me, finds some stitches much easier than I do, and vice versa. Pandora and I are both really grateful for a lunch break at 1pm. We need a breather! We are led down to the RSN shop on the ground floor, where we pay for our kits and most of us also manage to lighten our wallets a bit due to the lovely selection of kits, books, and stitching accoutrements. Then we grab a quick lunch in The Privy Kitchen cafe. I wish there was more time to have a wander but we're here to stitch not to sightsee! Most of the teaching in the class is done by demonstration in small groups. As each of us progresses and tries each of the stitch techniques required for the design, we are encouraged to move on to another stitch (rather than completing an entire section), and either Helen or Louise shows us how it's done. Throughout the class they walk around and inspect our work, offering suggestions about tension, size, or placement. Obviously we weren't going to be able to complete the whole design during the class. 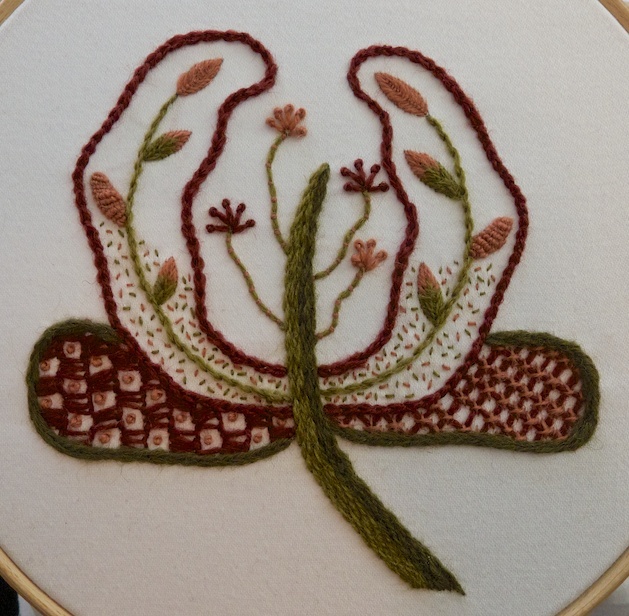 For me, the best thing about the class was actually being shown techniques, rather than learning them from books (which is primarily how I have learned embroidery thus far). Even though I've done zillions of chain stitches, when I saw the way that Helen worked it, it was a completely different motion, with a much more uniform result. I think I learned three stitches that I hadn't done before (the filling stitches and the heavy chain stitch) but what I did was really improve how I do chains, french knots, bullions, and stem stitches. I have to say I think they are a little bit mean giving us the design on cotton sateen fabric. Bearing in mind this class is intended as an introduction to this type of Jacobean/crewel embroidery, I felt it would have been better to teach us using authentic materials. Jacobean work is most commonly done on linen twill, which has a much looser weave. In my own experience, linen is much more pleasurable to work with, as the wool moves through the fabric more easily. Also you can use chenille needles, which have a long eye that is easier to thread and holds the wool more gently. Both things together mean the wool doesn't get that overworked/frayed look so easily. Working with the cotton just seems much more difficult to me and therefore more likely to discourage beginners. Apparently they will use linen for the 'progression with Jacobean' class that I am taking next month, so I'm happy about that! Apart from improving my techniques, what I really loved was just being in a room with 11 other women, stitching away, listening to the regular pop of the needle through the fabric, looking up and seeing the concentration on everyone's faces. Louise had some beautiful examples of Jacobean work brought out of the Studio's archives for us to examine - such gorgeous pieces! I probably could have spent the whole day just looking at them. In general I loved the day. Just being in Hampton Court really was special, and the RSN Studio really has a very wonderful, positive atmosphere that I absorbed like a sponge. I am very much looking forward to my two-day course next month. I have been working on my class design over the last week and I have finally finished it!